Maintaining a smooth, safe flow of vehicular and pedestrian traffic is difficult enough under normal circumstances. But when construction zones or road disruptions are involved, this task becomes significantly more challenging. 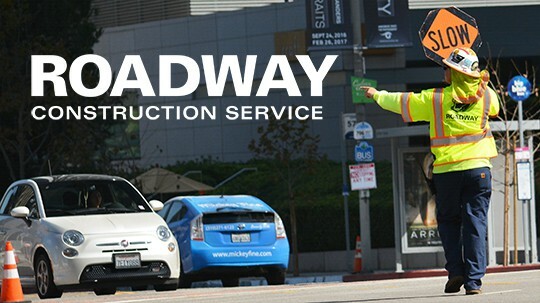 Roadway Construction Services (RCS) understands these challenges and consistently meets them with the highest level of road traffic control services. Road traffic control must cover many bases. At stake is the safety of drivers, pedestrians, construction workers, emergency crews and all other personnel who must be in and around an affected area. Bolstered by years of training and experience, Roadway Construction Service maintains a depth of resources capable of addressing a wide range of issues. Once deployed, these resources maximize work site safety on multiple levels. Each situation, of course, is unique. Weather, scope, traffic density, and other factors will impact the type of traffic control services provided. No matter what the roadway conditions or needs, however, one element remains constant – the traffic control plan. When devising a traffic control plan, Roadway Construction Services considers numerous variables. For instance – the number of crew members to deploy. This figure can vary tremendously. Do we need a single person to divert traffic away from a small side street? Does the job require multiple two or three-person teams to manage a forbiddingly intricate project? Duration also plays a role in the plan-formulation process. Will a road be closed all day to accommodate the transport of wide loads? In super-busy regions such as Los Angeles and Orange Counties, a long-term closure will cause a colossal traffic disruption — a disruption that will swell to brutal proportions during rush hour. A traffic control plan must take into account all aspects of such an event, including the monitoring and closing of intersections. Also important is the nature of the expected traffic. Vehicular traffic can vary significantly from area to area. Volume, vehicle type, population density, speed limit, and other variables impact planning decisions. Therefore, we must know what to expect in order to shape strategies accordingly. Conditions in Anaheim likely will be completely different from those in Century City, even at the same time of day. A reliable traffic control company such as ours will know the differences. When it’s time for resource deployment, Roadway Construction Services is ready with the right solutions. Perhaps we’re dealing with a multi-lane road requiring the closure of multiple lanes. In that case, we station multiple crews in strategic locations to maximize safety and traffic flow. Along with deployment of personnel, traffic barricades are a crucial component of effective road traffic control. These include K-Rail, orange barricades, traffic control cones, and general construction barricades. Yes, we’ve got a lot to think about. But considering what’s riding on our decisions, it’s time well spent. Would you like to learn how our road traffic control services can improve the safety and efficiency of your construction project? Reach out to Roadway Construction Service at (855) 907-7233 for more information about our industry-leading solutions and competitive traffic control rates.